If you’re bored with BMWs and uninspired by Audis, then Alfa Romeo claims that its latest medium-size family car is every bit as competent and luxurious as its German rivals. Plus it has Italian style to boot – including a quirky offset numberplate. It wants buyers to look at the Alfa Romeo Giulia instead of the BMW 3 Series, Audi A4 and Mercedes C-Class - as well as the Jaguar XE. It’s a tough task: these four are among the best all-round cars on the road, offering comfort, driving fun and high-quality interiors. Previous Alfa Romeos have had a reputation for being fragile but the Giulia's interior feels close to Audi quality – a very good thing. There are some nice touches that drivers of German premium cars will appreciate, most noticeably the ability to control the dashboard screen using a centrally mounted controller, rather than having to poke a touchscreen. The car isn’t exactly roomy inside, but there’s space in the back for two adults to sit comfortably. The Giulia is a traditional sports saloon, so it has has rear-wheel drive. The engine’s power isn’t sent to the front wheels – as with most other cars – so their only job is to steer, which usually makes the car feel nimbler and sportier. There is only one gearbox, an 8-speed automatic, but you can change gears manually with the gearstick or, on some models, with paddles behind the steering wheel. All petrol and diesel engines are quick and smooth but the sportiest is the Quadrifoglio (the name is Italian for four-leaf clover), powered by a V6 petrol engine built by Ferrari engineers. But that Ferrari-inspired performance isn’t cheap – a Quadrifoglio will set you back more than £60,0000. It’ll be too extravagant for most, but it does share some of its lightweight and hi-tech carbon fibre parts with cheaper versions. This helps to make the Giulia a light car. The diesel weighs 80kg less than the equivalent BMW 3-Series diesel and you feel that lightness when you take to the road. The car responds quickly to steering and resists lean into bends. Indeed, its stability gives you that happy sports car sensation of encouraging you to go faster and faster in corners. At the same time, the Giulia manages to remain impressively comfortable, matching the very best cars in the class (the BMW 3-Series and Jaguar XE) in this respect. A large family car, like the Ford Mondeo or VW Passat, might be cheaper and more practical, but the Giulia feels more luxurious, more fun to drive and is more stylish. The 2.2-litre diesel model is the most frugal choice, and the most sensible option for drivers who do large mileages. Alfa Romeo even claims identical economy figures for the 160hp and 190hp versions – so we say you might as well go for the more powerful choice. The diesel is the best all-rounder, and all models are good on safety spec, coming with forward collision warning and automatic emergency braking as standard. The Quadrifoglio is an absolute beast, with rip-roaring performance from its 510hp V6 engine. There are two standard trim levels: Giulia and Giulia Super, which comes with more equipment. The Super can be further upgraded with one of two equipment packs – Luxury and Sport. A third trim level, Veloce, comes with the 280hp 2.0-litre turbo petrol. The Quadrifoglio is only available with the V6 engine. Alfa Romeo model names include the engine size – 2.2-litres in this case – along with their power rating, in horsepower. The most powerful car is labelled V6: the engine is made up of six cylinders, arranged in a v-shape. AT8 means an automatic gearbox with eight gears. There is no manual option. The engines in the Alfa Romeo Giulia are all brand new, so they use some of the latest technology to make them powerful and economical. The most popular engine is likely to the be the new 2.2-litre diesel which is offered in 160hp or 190hp power outputs. The higher power version we tested was smooth and powerful, accelerating from 0-62mph in a claimed time of 7.1 seconds. The lesser-powered 160hp car takes 8.2 seconds. The range is on the small side when you consider the choice offered by the car’s premium German rivals, but there should still be enough choice to suit most driving habits and budgets. The sensible petrol option is a new 2.0-litre turbocharged unit with 200hp – and this compares favourably to similar engines made by BMW or Mercedes. It gives a decent slug of power combined with a pleasingly sporty noise if you put your foot down, but is also smooth and quiet when driving at a steady speed. Pick the Veloce model and you’ll get a 280hp version of the smooth and sporty 2.0-litre turbo, but this high-end model is several thousand pounds more expensive than the 200hp petrol. The Quadrifoglio engine is the 2.9-litre V6 with twin turbochargers to boost power without using much extra fuel and a thumping great 510hp on tap. Alfa says it was designed by the same engineers that work on Ferrari engines and the performance it delivers certainly wouldn’t shame a supercar. With a generous level of standard equipment, many buyers will decide that the standard model is all they need. It has cruise control and safety equipment such as automatic emergency braking that can stop the car and avoid a crash, as well as lane departure warning that sounds an alert if you drift out of your lane on a motorway. All cars also come with a 6.5in screen in the centre of the dashboard. Alfa has followed Mercedes, BMW and Audi in having a dial to control the functions - such as radio - which is generally safer on the move than using a touchscreen. A bigger 8.8in screen with 3D sat nav is available as an option. Move to Super and you get paddles behind the steering wheel for easier manual operation of the standard automatic gearbox, as well as upping the size of the alloy wheels from 16-inch to 17-inch. Some parts of the fabric seats are also replaced with leather. Speciale trim brings bi-xenon lights, dual chrome exhausts, 18-inch alloy wheels, leather sports seats and the larger 8.8-inch entertainment/sat-nav screen. Going up another notch brings you to the Veloce and Veloce TI models. These are only available with the 280hp petrol engine, but add a full leather interior, plus steering column gearshift paddles. TI buyers get alloys that mirror the range-topping Quadrifoglio’s, carbon fibre exterior trim and electrically operated sports seats. Alfa Romeo isn’t blessed with the greatest reputation for reliability, and sadly the Giulia doesn’t seem to buck that trend. In fact, in the 2018 Driver Power driver satisfaction survey run by our colleagues at Auto Express, just over 40% of Giulia owners said they’d experienced reliability issues – mainly with the car’s electronics. 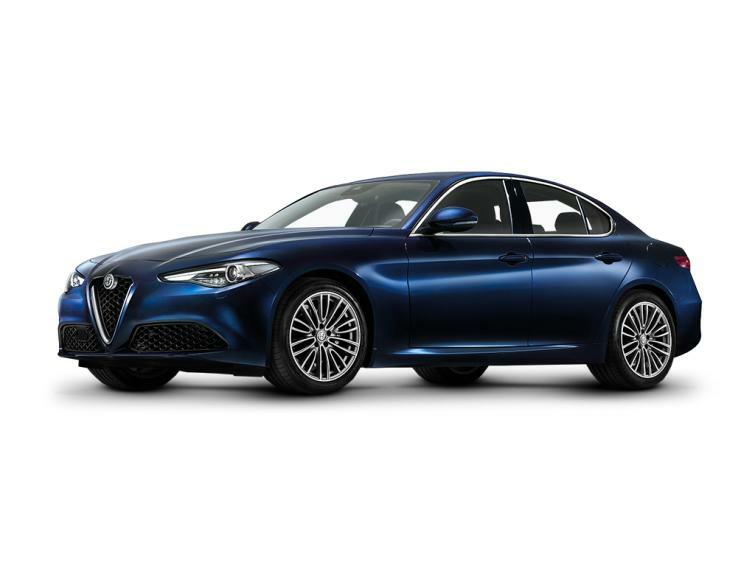 However, the same survey revealed that buyers absolutely love their Giulias and the Alfa saloon finished in the top three overall, with owners praising the car’s looks, performance and driving fun. Despite relative rarity and good reviews from both owners and the press, residual values aren't brilliant - which is great for used buyers. However, there isn’t usually a great deal of cars on offer. There are currently 22 Alfa Romeos available on BuyaCar, with prices ranging from £20,495 to £66,960 for nearly-new models. Monthly finance payments start from £281 per month.If you can afford it, we'd recommend a car built after October 2017 specified with Apple CarPlay and Android Auto. An offset numberplate is one of the stylish touches on the Alfa Romeo Giulia that the Italian firm hopes will attract drivers of German saloons. The Alfa Romeo Giulia is an alternative to the BMW 3 Series, Mercedes C-Class and Audi A4. Better-equipped Alfa Romeo Giulia models are confidently badged Super. If you pick the Luxury or Sport Pack, these cars will be equipped with brighter xenon headlights. The Alfa Romeo Giulia's dashboard screen is controlled using a rotary dial, which is easy to use without taking your eyes off the road. A V6, 510hp engine in the Alfa Romeo Giulia Quadrifoglio will accelerate the car from 0-62mph in 3.9sec. The top-of-the-range Alfa Romeo Giulia Quadrifoglio has a torque vectoring system, which can send different amounts of power to the rear wheels. It results in more precise cornering - and lets you stay in control while sliding the car for fun. This European-specification Alfa Romeo Giulia has a manual gearbox that's not available in Britain. It also has the optional 8.8in dashboard screen, which is. Alfa Romeo Giulia models come with a 6.5in dashboard screen as standard. Full leather seats are included on Alfa Romeo Giulia Super models if you pick the luxury pack.